Happy Easter to those who celebrate! And if you don't celebrate, then I hope you can still enjoy my pretty pastel nails! I really went wild with the spring colors for today's nails. I think I might have gone a little overboard, but I'm still enjoying all of the color! I guess this is the time of year for me to get my fill of mint and peach and pastel purple. I decided to add in a couple of other colors as well. I painted each nail a different color again, so I started off with Skittles nails. I used Nicole by OPI Paparazzi Don't Preach, Confetti Margarita Senorita, Revlon Jaded, Deborah Lippmann Let's Hear it for the Boy, and Sinful Colors Sweet Tooth. I used the same colors to decorate my nails too. I thought there was really no incorrect way to decorate Easter eggs, so I just started free handing random patterns. I didn't plan any out and just sort of went for it by adding straight lines, zig-zags, and dots. I used a very small nail art paint brush for the lines, and a medium dotting tool for the dots. I don't normally use separate brushes for my nail art, so some of the lines are a bit uneven. I even somehow managed to make the dots look a little wonky too! But I still think they're pretty and were a great way for me to use a bunch of pastels at once! 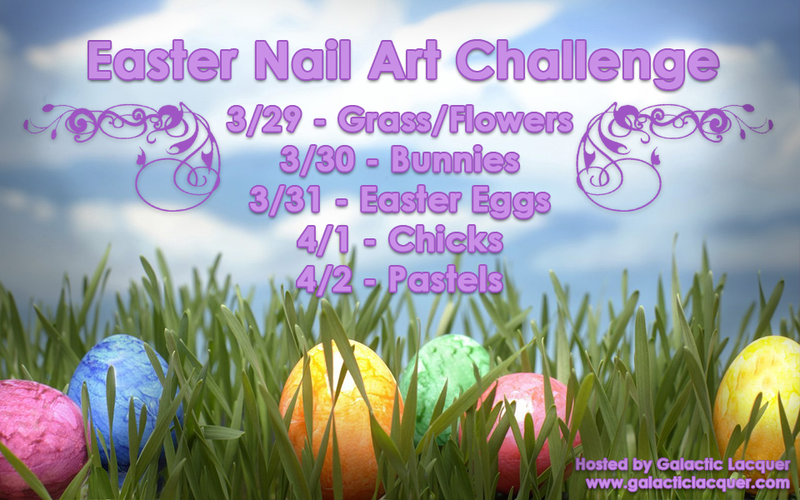 I think it's also a great time to compare them to last year's Easter nails I did. That was right after I made my blog. I think I've come a long way!